In providing a PRICE and ultimately a construction proposal please realize that this can involve digesting a great deal of information for the many interconnecting relationships. This is why a simple shopping list of unit pricing….may not be the best approach for getting what you are paying for. In most cases, a “unit price” as a standalone isn’t going to be a committed approach to providing a sound construction estimate without “limited” pre-qualification. You would be much wiser to recognize the limits of a hypothetical approach and invest your expectations in establishing the more meaningful absolutes for the requirements. Of course…this requires planning, designing and measuring the requirements. In preparing and setting up for concrete flat-work, performances, efficiencies play a very big role, relative to calculating costs. When performing a 500 SF area verses a 1,500 SF area the costs for labor, pumping costs and other costs considerations will have a different matrix with regards to a price per square foot. So…promoting a price per square foot without first qualifying the square footage is truly placing the horse before the cart. Additionally, installing pipes and conduits will generally require trenching…the quantity of pipes that get installed into a installation practice that is referred to as a “common trench“, will make the costs for opening up a trench dividable by the amount of pipes that go into the trench. Hand trenching and mechanized trenching of course have very different operational expenses and production rates. So…this is where experience plays a very important role in determining the most effective approach with regards to efficiencies. All of these require a knowledgeable background in order to make you the beneficiary of a detailed estimate that is truly connected to an anticipated and intended approach. Why do “Change Orders” come up? Well…most often it’s because something was missed in the estimating stage. Who better to identify the requirements…the Contractor or the Homeowner? What vehicle would be most appropriate for identifying a true commitment for intent…a published “Cheat Sheet” with generic unit values or a detailed, dimensioned plan that exhibits your project specific requirements? Many “Production” style swimming pool sales teams work from what can be referred to as a “Cheat Sheet”. They estimate from established hypothetical averages often prepared by corporate controllers. These are not prepared on a job specific basis and in some cases they never get revised to reflect a current status for their accuracies. This is one reason you hear about the large production builders going bankrupt every few years. Many homeowners assume that these guys are truly experts at building pools but, the reality is that they have only streamlined the selling process of a swimming pool…… to those most susceptible… the price conscience consumer. In this way…production swimming pool companies can use salespersons that may have never actually built a swimming pool project before to provide you a bid just by adding up a list of components. Although this practice is performed quite frequently by the larger pool companies, we believe that this is just laziness…that a clearer view for the bigger picture……can be observed for what you are actually buying! If you have gotten this far in this article…well then you may be that one in fifty consumers that are actually smart enough to be our client! This may sound arrogant but, actually it’s complimentary to us both. You see…I’m confident enough to know what I’m saying is an absolute truth, because we build not just sell swimming pools and you have been patient enough to entertain what that difference can mean. A successful swimming pool business shouldn’t just be about how many pools can be produced but, how many projects were planned for and constructed correctly! As a builder’s volume goes up…the ratio of supervision to performances goes down. So…if logic prevailed…it could be noticed that the bigger builders are positioned exponentially to make more mistakes. In requesting a proposal that is to include everything (without extra charges down the line) explanations and clarifications for what is unknown i.e. Hard Dig Conditions, etc. will need to be understood. In drawing up your swimming pool a complete picture evolves for what will become the requirements. This developed understanding is the basis for establishing our quantification and connecting our commitment to a graphically expressed intention. In this way everyone can be sure that they are on the same page. I list every item of consideration both on plan and in our line item proposal. In making each component a consideration they of course have a value. Although as an individual item these values involve the deployment of manpower and equipment that revolve around an economy of scale as each interrelates to the opportunity of us being staged to perform. Therefore, the proximity to each element of the work has an effect on the efficiency of performing the paralleling tasks that will be required. In knowing what is to be made inclusive beforehand we can better prepare for our obligations. So, we invest a great deal of time into pre-qualifying the intent on plan! In this way….you receive the best price we have to offer while we become fully aware of everything that will meet your expectations. As an example after producing a preliminary design you may request us to re-position the Pool’s equipment location. This may involve a longer conduit run and wire together with a larger conductor. This consideration together with many others from our perspective doesn’t break-out as a per foot unit value when committing to a planned intention because the diagram represents the measurement as an all inclusive item. When designed, expressed and committed to the line item work scope becomes the entirety of the requirement that is being planned for and executed. I believe the objective is to get everything on a plan…. provide you with a proposal that identifies all the work described, produce a construction proposal that can be well planned out and then move forward in the direction of a highly committed approach with clear expectation. If our accumulative total price isn’t competitive on the merit of the combined value then we probably won’t be selected as a performer, when being judged on the merits of a competitive price. Equally significant is that if a unit price for a standalone element seems excessive in the digestion of a limited range of view for the requirements well…then, the subjectivity of the perceived value can also disable the opportunity for us to perform. So…it is through the critiquing of the process by those willing to recognize these differences in approach, that we separate our opportunities for success from disaster. Of course we want your business but, if you are unwilling to work through the process of developing a good plan (where we can identify the complete requirements to a committed approach) what stability can be expected when building a relationship upon such shaky foundations. While investing a fair amount of time into our professional attempt at discovering your desires we are made aware of your expectations. Although estimates are almost universally considered “free” how is it that in a logical world one could place value upon something that is absent of worth? 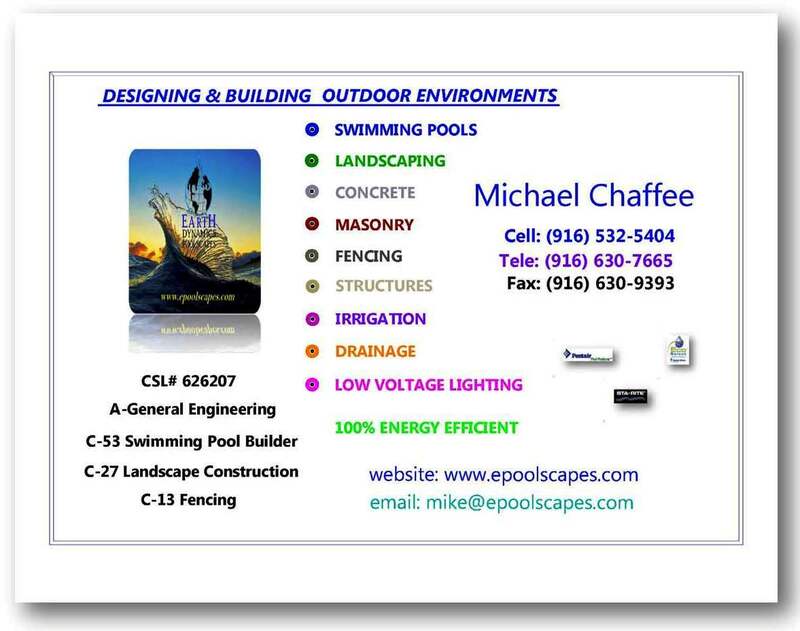 I believe we produce the greatest plans available and we build a great pool at a very good price value! I know that this approach has afforded us many successful accomplishments and I am convinced that in the many thousands of times I have performed, that this approach is the best chance we have for getting it clear from the beginning. We bring to the table of negotiations a level of commitment seldom seen in our industry and we work very hard at qualifying every obligation and responsibly prior to casting the dangling lure of a low price, that is all too often absent a verifiable specification. So in closing…if our business principles and understanding for the process appear to parallel your perspective…please do engage us further in pursuing the many elements of discovery that can result from preparation and planning. In doing so…your expectations for the results… will be anchored in the reality of knowing that your Contractor has already built your project on plan and in his mind.